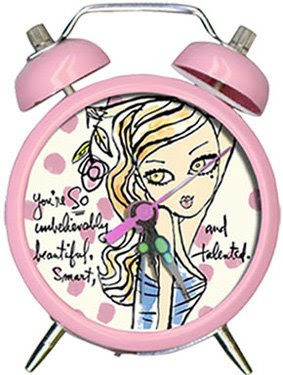 While it would be lovely to always wake up naturally, without an alarm clock, most of us find we do need the clock. Here are some choices you may not have seen before. 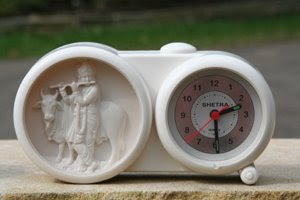 This Krishna alarm clock "sings a good will mantra from Lord Krishna" or wakes you with "a Hare Krishna chant," depending on which web site you read. Looking at the manufacturer's web site, it seems the clock is available with the images of other deities, such as Ganesh. There's definitely a Jesus version. 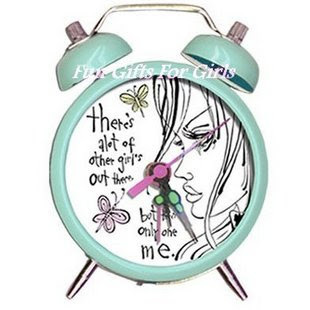 Moving from the sacred to the profane, this alarm clock is part of the Bobbypin collection by illustrator Jeffrey Fulvimari, who did the drawings in Madonna's book The English Roses. While it's harder to actually read the time than I would like, the affirmation might a nice way to start the day. Update on March 10, 2011: I'm no longer seeing this clock being sold. Here's another alarm clock from the Bobbypin collection.